Passable main courses, but decadent honey 'pie'! Fancy dining in a setting that looks like a castle underground? 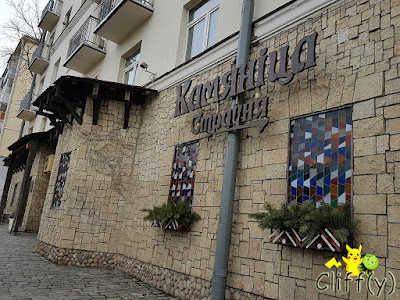 Serving classic Belarusian dishes and something from the days gone by when Belarus was part of the Grand Duchy of Lithuania, Kamyanitsa is committed to using environmentally sustainable ingredients. Another piece of information to share is that Kamyanitsa has hosted a few folk festivals since 2011. 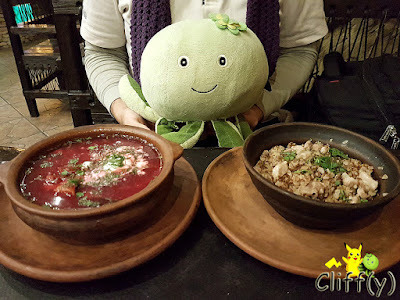 My BFF and I were thinking of sharing a bowl of soup for appetiser, but it turned out to be much more filling than expected due to the generous portion of buckwheat. 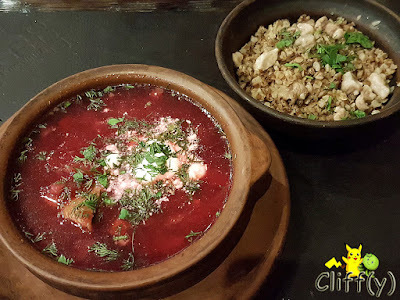 The cold beetroot-based soup with sour cream had potatoes, carrots, onions, garlic and somewhat tender pork ribs. I love pig ears, but I wasn't sure what expect as that was my virgin experience with them in a Western dish. 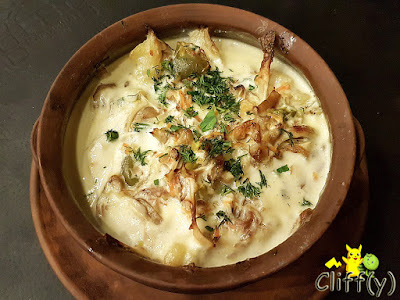 The main course featured pig ears that had been fried till crispy before being mixed with sour cream flavoured with potatoes, garlic and herbs. To be frank, the dish was pretty good in terms of flavours, but quite heavy at the same time. I feel that it should be shared among at least three people. 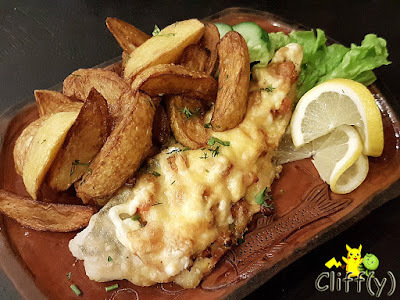 Presented on the plate was a piece of fresh pike perch stuffed with chopped bell peppers, tomatoes and onions and subsequently baked with cheese. It wasn't the highlight of the lunch, but decent enough for sure. The potato wedges, however, left much to be desired as they were way too dehydrated and not crispy at all. Pika's advice: Be careful of bones in the fish! The lunch ended on a high note with an amazing honey cake as how I'd call it, rather than a pie. 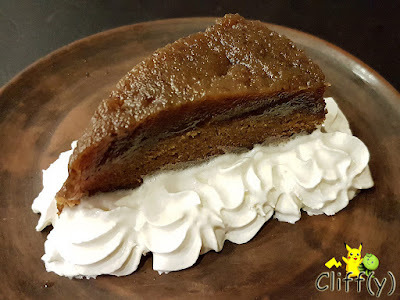 The cake was a delight to have with its delectable sweetness that wasn't cloying, as well as the nice aroma of honey. Having said that, I suppose they could use less whipped cream to decorate the cake. 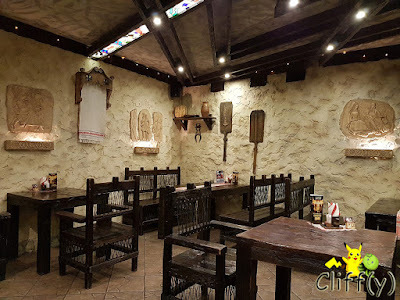 The exterior may not be the most inviting compared to that of other restaurants, but the interior is certainly something memorable.